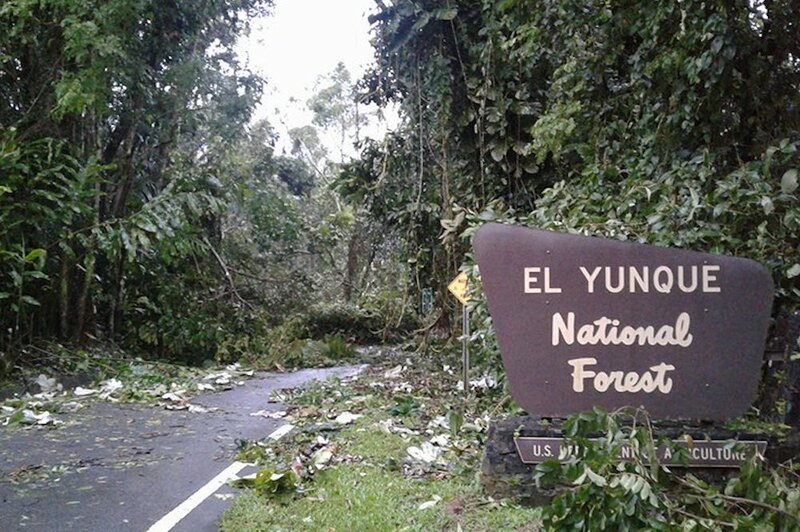 The entrance to El Yunque National Forest, near the International Institute of Tropical Forestry Sabana Field Research Station, after Hurricane Irma. Photo courtesy of Joel S. Olivencia, International Institute of Tropical Forestry, U.S. Department of Agriculture. El Yunque National Forest in Puerto Rico is one of the jewels of the United States system of national forests—and its only tropical rainforest. When talking about El Yunque, forest ecologist Jess Zimmerman can’t help describing what happened here during hurricane season last year: “First, we had Hurricane Irma. I call that one a ‘drive by.’ It wasn’t so bad, and it got us all ready for Hurricane Maria, which went the length of the island. After Maria, if you looked out the window here, there wasn’t a leaf on a tree.” Right after the storm, it took construction crews eight days to open the road to the research station Zimmerman manages. Excavators shoved the trees to the side and cleared the boulders and dirt from several landslides. When I visited, six months after Maria, the roadside debris still hadn’t been removed. Electric lines drooped from trees or lay abandoned on the shoulder. Tattered blue tarps served as makeshift roofs. Other houses stood abandoned, missing doors and windows. Power to many rural areas hadn’t been restored, which meant that thousands of people were living without refrigerators and other necessities that we take for granted. Many people had left the island to escape these conditions, and a study published in the New England Journal of Medicine estimates that several thousand people may have died because of the storm. Hurricanes are a natural occurrence, and the island and its people know them well. If you want to study what happens when hurricanes hit tropical forests—which they are doing with increasing frequency—then El Yunque is where you want to be. The forest here was hit hard by Hurricane Hugo in 1989, had considerable damage from Georges in 1998, was side-swiped by Irma in early September 2017 and then floored two weeks later by Maria and her 140-mile-per-hour winds. For nearly a century, scientists have been observing how El Yunque handles hurricanes. Ecological systems don’t function separately from human systems. Rather, the two are always intertwined. Researchers at El Yunque attempt to parse how human actions—such as building roads, harvesting timber, and diverting water for domestic and municipal use—affect how this forest deals with its periodic hurricanes. El Yunque is uniquely positioned for not only observing but also measuring what happens when hurricanes “batter” the forest, though scientists like Zimmerman actually use the word “affect.” This is not simply a scientist adhering to a language standard, it’s how the scientists at the Luquillo Long-Term Ecological Research site routinely describe what happens here. Changes this dramatic and on this grand a scale are natural. These forests have evolved with hurricanes, so they are remarkably resilient. “Everybody asks, ‘How’s the forest?’ It’s a hurricane forest, it has gone through this before. It looks pretty bad right now, but you wait,” Zimmerman said. He’s confident in its recovery because he and his colleagues have seen it happen before. 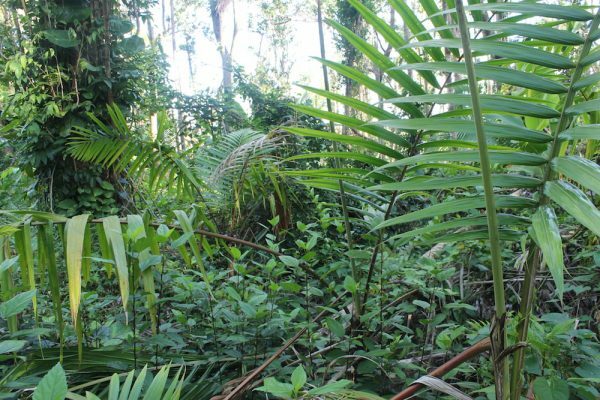 Since the 1940s, foresters then ecologists and biogeochemists at El Yunque have been staking out their study plots, delineating them with surveyors’ pin flags and white PVC pipe. The forest is further festooned with mesh baskets to measure how many seeds and leaves fall from trees and plants, flagging tape (green, orange, yellow, red) to mark study areas that are monitored regularly, small solar collectors to run equipment, and instruments for recording all sorts of data, including soil nutrients, temperature and humidity, tree diameters, and outputs of methane and nitrous oxide. If you want to study what happens when hurricanes hit tropical forests—which they are doing with increasing frequency—then El Yunque is where you want to be. The roof to the research building had been blown off, and trees were leaning on other buildings. After assessing the damage, and locating some tarps to stretch over the missing roof, Zimmerman led a crew out to the forest. His staff, along with some researchers and volunteers, used hand saws and a lot of grunt labor to open the trails to the various study plots. They worked steadily and with a sense of urgency, as a number of the experiments relied on timely data collection. For instance, the staff measures nitrate and potassium levels in the soil water every two weeks, and understanding Maria’s effects on these nutrients was crucial. “It’s samples like that you don’t want to lose the rhythm to in an event like this,” Zimmerman explained. The most striking thing about the forest in those first days was its new color: brown. If you gazed up at a once verdant hillside, you might think it had been burnt—all the green leaves were gone. No mature tree, anywhere, can withstand 140-mile-per-hour winds. Along with the leaves, something has to give, and it will be the weakest part of the structure: the roots, the trunk, or the crown. In temperate forests where hurricanes are a rarity—as in much of the mainland United States—most large trees are uprooted because the roots are the weak link. In the tropical forest at El Yunque, the roots held, some of the trunks were snapped, but nearly all of the crowns blew apart. The vast majority of the trees—maybe 95 percent of them—remained upright, even though they’d lost most of their limbs, branches, and leaves. It was as if someone had replaced trees with telephone poles. During Hurricane Maria, high winds snapped all of the branches off the crowns of trees in the forest, leaving these bottle brush-like trees. Photo courtesy of Stephen Long. Six months after the hurricane, when I visited Luquillo and walked out into the forest with Zimmerman, the green had returned. The telephone poles had already transformed into bottle brushes—their green leaves growing like bristles from the upper stem. Unlike mainland forests, a tropical forest has no dormant season, so the palm, the tabonuco (known for grafting its roots to those of its neighbors), the ausubo, with deep buttresses at its base, and all the other trees began sprouting branches and putting on leaves almost immediately. The trees had no time to waste, because they continue to respire and the only way to replenish the storeroom of carbohydrates is through photosynthesis—which requires leaves. Luquillo’s forests are primary forests, which means that they were never cleared for agriculture, unlike most of Puerto Rico’s forests. There has been some sporadic logging, but that ended 70 years ago. So some of the larger ausubos and tabonucos are surely hundreds of years old, though it’s impossible to know, since the lack of a dormant season also means there are no annual tree rings to count. It’s safe to assume that many of these trees stood through San Felipe II in 1928, the most recent hurricane comparable in strength to Maria. The strategy that has enabled them to survive this long is that they sacrifice their crowns, like sailors reefing their sails when the wind gets too rough. Any species less windfirm has been knocked off the mountain by now. Researchers have shown that selection for hurricane resistance also operates within species. Palms and mahoganies grown from seeds from hurricane-prone areas are more windfirm than those from areas lacking hurricanes. Even though the greening of the canopy overhead was spectacular, it was no match for what was happening on the ground, where a sea of verdant jade was flooding in around us. Zimmerman pointed out the pioneer tree species soaking up the sun. These species cannot grow in the deep shade of a rainforest, but when a hurricane blows the canopy away, they seize the day. Seeds that were deposited in the soil decades ago—the last time the canopy was wide open—suddenly have enough sunlight to germinate. They do so by the thousands. One of these pioneers, the cecropia, gathers light with a leaf so huge it could function as an umbrella. After the hurricane removed the dense tree cover that shielded the forest floor, sunlight awakened seeds—some of which had been waiting for decades—and the green understory sprang to life. Photo courtesy of Stephen Long. Grasses, vines that completely envelop tree trunks, begonias, tree ferns, all of these plants thriving in the sudden gift of sunlight are turning what was once an open park into a puckerbrush. But they are racing against the clock. This is a very dynamic time at Luquillo. Can any of the new trees grow fast enough to make it to the canopy? Sprouts on residual trees become branches, branches become limbs, and the canopy fills in the gaps. The 30 percent canopy cover of today will return once again to a full canopy, leading to light levels near the ground low enough to make photographers weep. And the live-fast, die-young pioneer species will indeed die young, starved of sunlight, though they will most likely have made plenty of deposits in the seed bank. The ecological concept of resilience is surprisingly straightforward. It is a measure of how long it takes for a system to return to pre-disturbance conditions after an event like a hurricane. 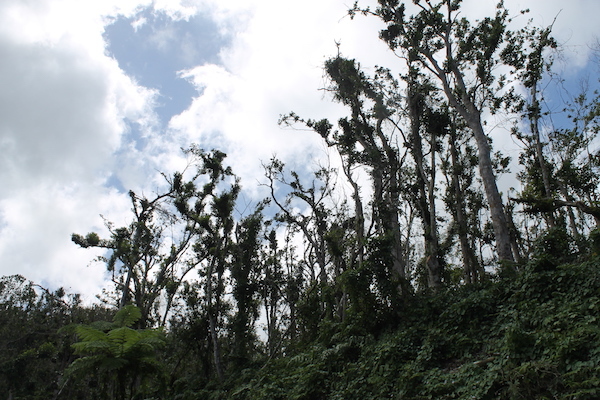 The forests of El Yunque have shown that within 25 years, they can return to pre-hurricane conditions. Only time will tell if Puerto Rico’s political, social, and economic systems will be able to make the kind of recovery that we can expect to see from its treasured rainforest. Stephen Long is author of Thirty-Eight: The Hurricane That Transformed New England. Based in Corinth, Vermont, he is the founder of Northern Woodlands magazine.